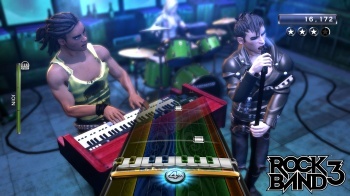 Mad Catz has signed a deal to re-release Rock Band 3 for the 2011 holiday season. Rock Band 3 bombed pretty badly when it came out last year, badly enough that Harmonix parent company Viacom put the studio up for sale and ended up taking 50 bucks for it. But that's not stopping Mad Catz from trying again this year with a re-release of the game, this time bundled with its own Rock Band 3 peripherals, including a wireless Fender Mustang Pro guitar controller that will help players learn to play real guitar and bass parts from the Rock Band set list. "Rock Band is the ultimate interactive experience for any music fan," said Mad Catz CEO Darren Richardson, "whether they're looking for a great party game to share with friends, playing through Rock Band's 3000 plus song library, or seeking out a fun way to learn guitar, drum or keyboard skills using Rock Band 3's PRO Mode." Rock Band 3 didn't tank because it's a bad game [it owns a 93 rating on Metacritic] but because the music game market is saturated and for most gamers, it simply didn't bring enough to the table to warrant yet another expensive, multi-peripheral purchase. How Mad Catz plans to get around that is a mystery; consecutive holiday seasons isn't much of a cool-down period for a franchise the public is obviously sick of. Price could go a long way toward increasing the appeal, but Mad Catz did not indicate what the re-released edition will sell for.